Canon ha recentemente annunciato il successo della trasmissione live in 8k della partita di Rugby tra Giappone e Italia. Il match si è tenuto presso la Oita Bank Dome nella prefettura di Oita, situata a sud del Giappone e il live streaming al quartier generale della compagnia, a Tokyo. Per l’esperimento, Canon ha utilizzato fotocamere ed obiettivi 8K e il segnale video è stato trasmesso in diretta via satellite al quartiere generale Canon a Tokyo. Per la proiezione è stato utilizzato un display 8K HDR e 4 proiettori 4K HDR. Canon dichiara di aver “realizzato un’esperienza di visione estremamente coinvolgente attraverso immagini altamente definite e con una gamma dinamica di colori elevatissima”. La trasmissione di video 8K comporta l’invio di segnali video compressi utilizzando encoder e decodificatori dedicati e cavi in fibra ottica. Di seguito il comunicato ufficiale di Canon. TOKYO, June 12, 2018—Canon Inc. announced today that on June 9 the company successfully concluded an 8K live-video transmission experiment. Leveraging the company’s input and output technologies, and in cooperation with partner companies, Canon relayed the Lipovitan D Challenge Cup rugby match between the national teams of Japan and Italy that took place at the Oita Bank Dome in Oita Prefecture, located on Japan’s southernmost main island of Kyushu, to the Company’s Tokyo Headquarters. For the experiment, Canon used proprietary 8K cameras and lenses to capture footage of the match, which was transmitted live via satellite to the Company’s Tokyo Headquarters where it was both screened in 8K on an 8K/HDR* display and projected in 8K using four 4K/HDR projectors. Using Canon 4K and 8K input and output technologies, the Company accomplished an immersive remote live viewing experience through expressive video images with a high dynamic range and wide color gamut. Conventional transmission of 8K video involves sending video signals compressed using dedicated 8K encoders and decoders through such communication mediums as fiber optic cables. 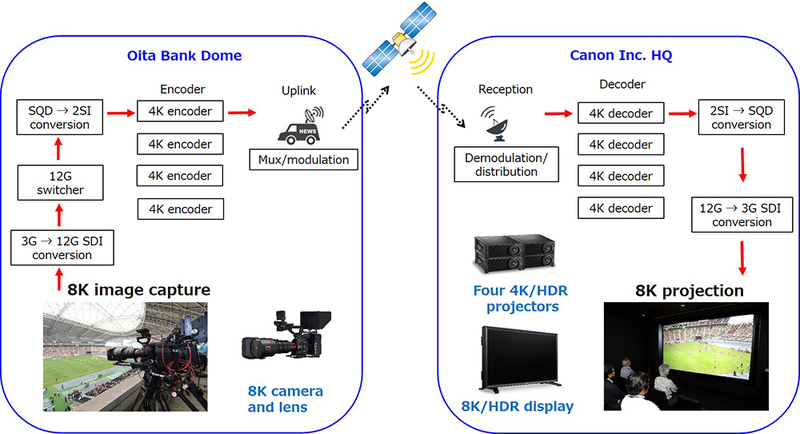 However, in cooperation with partner companies, compressed 8K video signals have been successfully transmitted via satellite using a setup comprising four existing 4K encoders and four existing 4K decoders. With the successful transmission of 8K video using existing 4K technology, the increasingly widespread use of immersive 8K footage, including the public viewing of sporting events in multiple locations, is anticipated. Canon is currently developing such viewing experiences as the Free Viewpoint Video System, which makes it possible to watch sports from various viewpoints and angles, and the Spatial Imaging Solution, an immersive experience that makes viewers feel as if they are in the stadium itself by outputting high-resolution video on a large screen that covers the viewers’ entire field of vision. Canon is an official sponsor for Rugby World Cup 2019TM, Japan and, based on a sponsorship agreement with the Japan Rugby Football Union, an official supporter of the Japanese National Rugby Team. Going forward, the Company will contribute to generating interest in such sporting events as Rugby World Cup 2019, Japan through the development of imaging technology that offers realistic immersive experiences. Resta aggiornato sulle ultime offerte online e sugli ultimi blog, iscriviti al Canale Telegram Effesedici .